From the British Library, dated 3 February 1806. A ( probably apocryphal) tale of cheek rewarded! 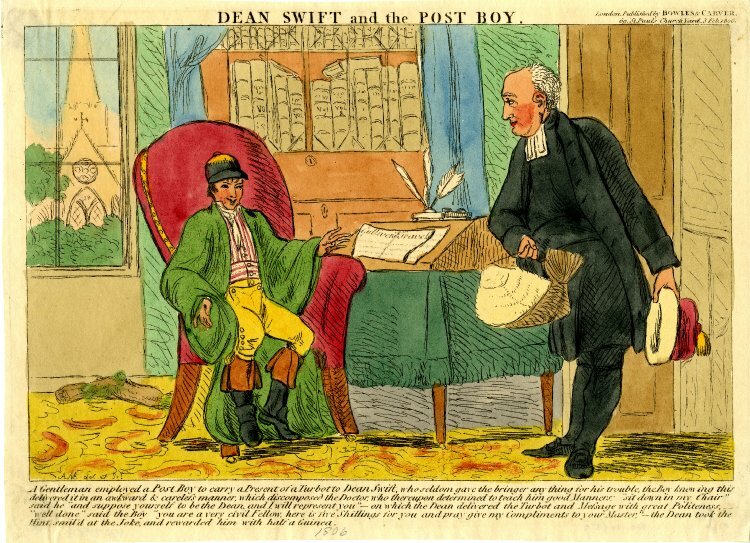 A Gentleman employed a Post Boy to carry a present of a Turbot to Dean Swift, who seldom gave the bringer any thing for his Trouble, the Boy knowing this delivered it in an awkward & careless manner which discomposed the Doctor, who thereupon determined to teach him good Manners: “sit down in my Chair” said he “and suppose yourself to be the Dean and I will represent you” – on which the Dean delivered the Turbot and Message with great Politeness, – “well done” said the Boy “you are a very civil Fellow, here is five shillings for you and pray give my Compliments to your Master” – the Dean took the Hint, smil’d at the Joke, and rewarded him with half a Guinea.